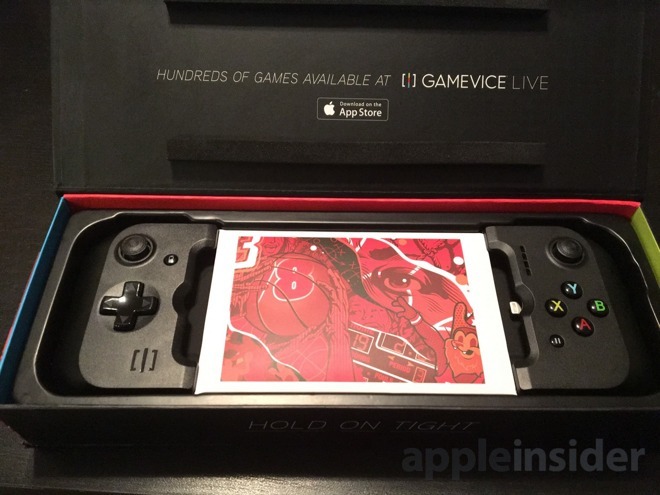 The Gamevice is a physical gaming controller that fits iPhone 6, iPhone 6 Plus, iPhone 6s, and iPhone 6s Plus. It's available from Amazon and Best Buy for $99.95. Like most other gaming controllers for iOS, it features two joysticks, a D-pad, four face buttons, and four shoulder buttons. It's powered by an internal 400 mAh battery, and connects to the iPhone via a Lightning plug, which means no need for a Bluetooth wireless connection. The Gamevice is noteworthy because it's the first Lightning-connected controller we've seen that fits the latest iPhone 6 and iPhone 6s series. Previously, AppleInsider reviewed both the Moga Ace Power and Logitech PowerShell with Lightning connectivity. But both of those were designed for Apple's iPhone 5 and iPhone 5s series, and do not fit the iPhone 6 or 6s. Right off the bat, this spotlights some of the issues the Gamevice may face down the road. 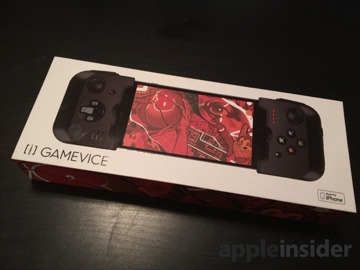 A clever design for the Gamevice allows both the 4.7-inch iPhone 6/6s, and the larger 5.5-inch Plus models to fit the accessory, but there is no guarantee that a mythical "iPhone 7" will also fit. We can't ding the product for this, because who knows what the future will bring. But still: Buyer beware. 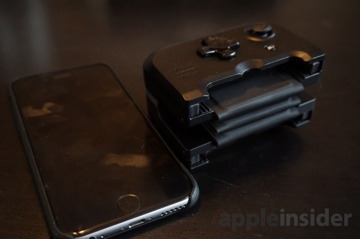 We used the Gamevice with our iPhone 6s and found that we really enjoyed the clever design of the device. Gamevice has two pieces: a left side with the D pad and joystick, and right side with second joystick and face buttons of A, B, X and Y. Both sides feature both a trigger and bumper. These two pieces are connected by a rubberized, folding piece dubbed the "flexbridge." 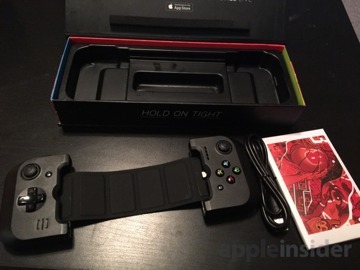 When extended, the two sides of the controller fit securely around the iPhone and hold it in place. There is also an extension slider on the back, and a locking mechanism on the right side, to allow users to choose between fitting an iPhone 6/6s, or a larger Plus version. When it's not in use, the flexbridge can be folded accordion-style and sandwiched between the two controller halves. These hard plastic pieces attach to the backs of one another magnetically. This feature aids in the portability of the Gamevice, though it still isn't pocketable in any fashion. Still, we had no problems throwing the unit in a bag, and appreciated the collapsible design. Connecting the Gamevice was also easy and simple. And when placed inside the snug slots and connected to the Lightning plug, we had no worries that our iPhone was going to fall out. 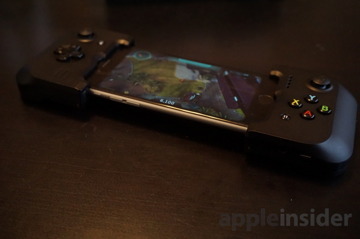 The unit recharges through a micro USB port, which also passes power through to the iPhone, allowing users to charge and play a game at the same time. Another welcome inclusion with the Gamevice is a dedicated headphone jack. When used, iPhone audio passes through the Lightning port, allowing you to connect a standard 3.5mm headphone to the bottom of the unit. The device can also be used without headphones if you prefer. We were pleased to find that the solid construction and design of the Gamevice also extends to the buttons as well. Both the face buttons and joysticks are responsive and well built, giving the controller a premium feel. The D-pad is serviceable, as most are these days. If we had to single out a weak point, it'd be the triggers and shoulder buttons. They're not bad, per se, but they aren't as strong as some other iOS controller options —which retail for much less than the Gamevice. Specifically, we take issue with the triggers, which lack any discernible "depth" to them. While the buttons can be pressed and give a satisfying feel of a click, there isn't any range for a lighter or deeper press as on other triggers, most notably the SteelSeries Stratus. That issue aside, the Gamevice feels comfortable in the hands, and we had no problems using it for compatible titles like Geometry Wars 3, Halo: Spartan Assault, and the Metal Slug series. As with other physical controllers, playing titles with the Gamevice is vastly superior to touchscreen-only controls, for most games. If you buy this controller, you will have a much better gaming experience. Our main knock against MFi controllers remains Apple's fault, because the iOS App Store does not identify which downloads support third-party gaming controllers. 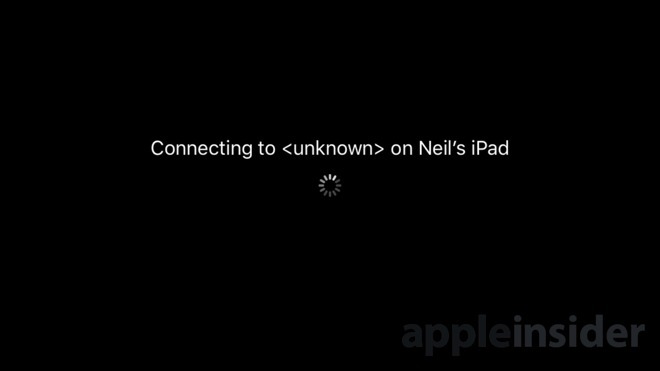 Apple addressed this issue with the new Apple TV and tvOS, but the problem still remains on iOS. 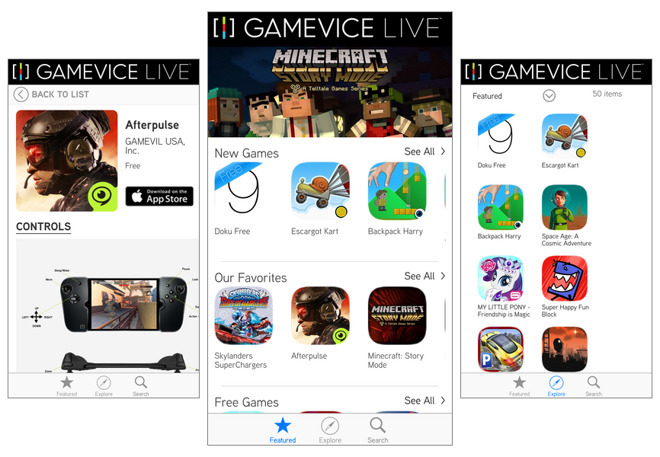 Gamevice has, thankfully, addressed this in its own way, and offers the "Gamevice Live" app as a free download. We're happy Gamevice Live exists, though the app is glitchy. When scrolling, we found that it would frequently accidentally select an app. Aside from this bug, it's well designed and does what it needs to do. Gamevice Live is a curated list of controller-compatible apps, addressing a problem that Apple created. There are three tabs —Featured, Explore, and Search —while apps are sorted in categories like "New Games" and "Our Favorites." It's a nice way to discover titles for your new accessory. The app also displays Gamevice-specific controls, featuring images showing exactly what buttons on the device will accomplish certain tasks in specific games. Of course, much of this wouldn't be necessary at all if Apple simply displayed controller support in iOS App Store listings. The company has done so on tvOS, but has not on iOS. 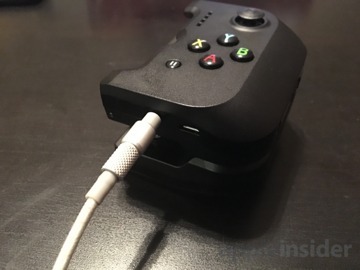 And there is no way to use Gamevice with tvOS (yet). Which is another Apple-related issue in and of itself. 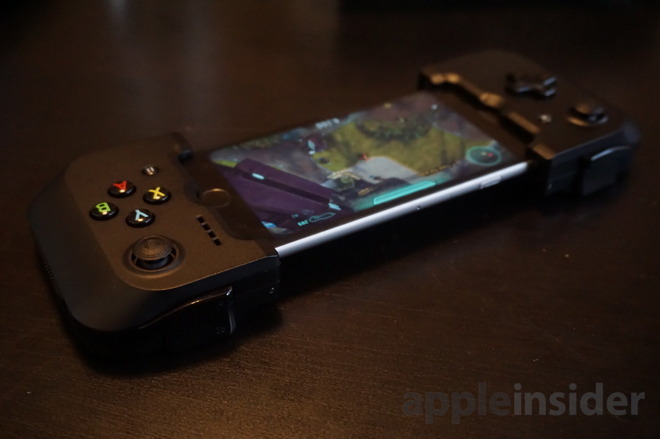 It should be noted that the Lightning-connected design for the Gamevice makes it a much better option for iPhone gaming on the go than, say, the excellent SteelSeries Nimbus. While we had high praise for the Nimbus, its lack of any sort of mount for the iPhone makes it an Apple TV- or iPad-only affair. 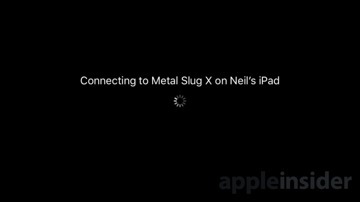 It's for that reason that we were particularly keen to try out a feature Apple introduced back in iOS 8, dubbed "Controller Forwarding." Controller Forwarding is intended to extend the value of Lightning-connected controllers by allowing them to be used wirelessly with other devices, like an iPad or Mac. 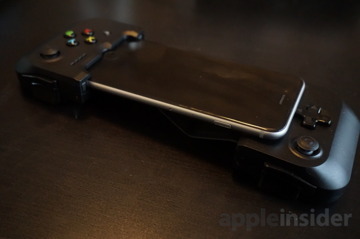 In theory, an iPad or Mac running a compatible game would connect to an iPhone with a Lightning controller attached, like the Gamevice. 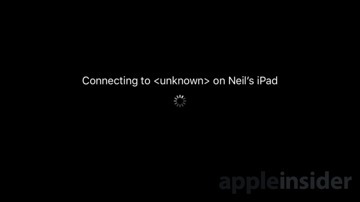 When Controller Forwarding was introduced at Apple's 2014 Worldwide Developers Conference, the company made it sound like the feature would "just work," with minimal effort needed by users or developers. Supposedly, any game supporting the default setup for physical gaming controllers would be able to use Controller Forwarding. Considering the Gamevice was the first Lightning-connected controller we got our hands on since the launch of iOS 8 and the iPhone 6 in 2014, we were excited to see how well Controller Forwarding works. The answer: It doesn't really work at all. 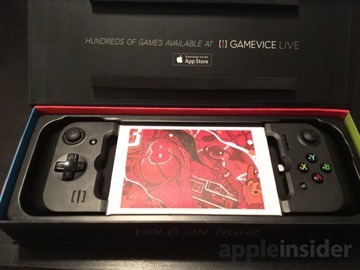 In our tests, only a handful of games even showed the option to connect our iPhone 6s with Gamevice to our iPad Pro. Both devices were running the latest version of iOS 9. In the event that we were shown the option to connect (either via the lockscreen or the app switcher), the controller either didn't properly connect, or it just didn't work at all. In short, we couldn't test Controller Forwarding with the Gamevice, because we couldn't get it to work, despite repeated attempts, and a request for help directly to Apple. From what we could find, there is no Controller Forwarding support for tvOS either. 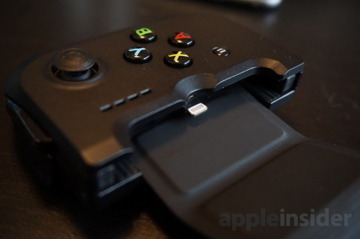 This means your $100 Gamevice will only work with your iPhone, and nothing else. For now. If you're OK with the fact that it might not fit an "iPhone 7" and beyond, and you don't mind the $100 price, there's a lot to like with the Gamevice. The unique design works. But as it stands, you will only be using your Gamevice with an iPhone 6/6s or Plus. Without functional Controller Forwarding, as far as we could find, you can't use this device with your iPad, Mac or Apple TV. Still, at $100, this is a pricey accessory. 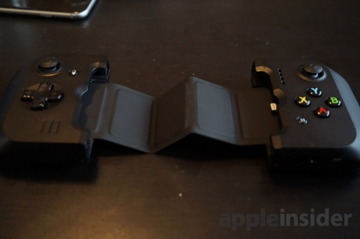 Especially when you consider that there are other models with iPhone clamps for playing on the go that cost half as much as the Gamevice, or less. 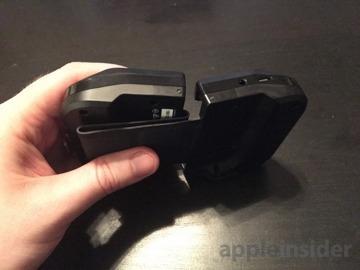 If you want an iPhone controller and don't mind Bluetooth connectivity, the MadCatz C.T.R.L.i series features a removable iPhone clamp and can be had for under $50, though it lacks a rechargeable battery, instead relying on AAAs. There's also the Moga Rebel, which costs $80 and does have a rechargeable battery. Regardless, it's good to have options, and the Gamevice's unique design makes it a welcome addition to the lineup. We just have a hard time recommending it over other options at its current $100 price point.